We did it. 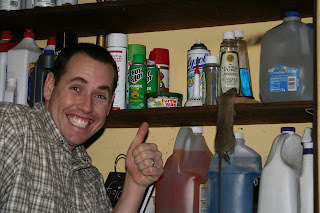 For those of you who have never had a rodent problem, consider yourselves extremely lucky. There is nothing worse than trying to put your children to sleep at night with rats, (yes, not mice rats) running around squealing and pretty much just grossing you out. Or waking up in the middle of the night and hearing them, scratching, fighting, mating, or whatever they do right above your head. Just anticipating them all falling through the ceiling and landing on top of my bed. We got traps and went to work, it's kinda funny that we would get so excited and check the traps almost hourly during the day, and first thing in the morning, and Scott and I before we went to bed would go check again. We got 4 and the problem is gone, this was the last one that was murdered so terribly. We got creative with our traps and set this particular one on the end of the shelve. Well he jumped up to get the treat a WHAM!!!! It did exactly what we had hoped, what a great picture right, there he is dangling in mid air with his head clamped. The murder was so proud. As you can tell we put alot of planning into exterminating our little friends, it sounds really sick and twisted. So I guess we are when it comes to killing rodents. Please do not be afraid, they are gone. We may all rest in peace now. OMG that is so sick....it is HUGE. Gross, were those there when I was visiting? If so, Im glad you didn't tell me! I would have been afraid of them falling on my head too. Im sure your releived that they're gone! The "murderer" is really cute but I hate his friend!! I also hope they weren't there when I was. If they were, please don't tell me! How do you know you got them all?? If only one is left, the playing will stop or be more quiet....worry, worry! You HAVE to ask Eliot about his rat stories, you'll get a great kick out of them, I think you have to have lived with rats to appreciate, so I know you would!!!! Those are nasty!! I hate rats. I hate mice. I hate all rodents. Whenever the kids are watching Ratatouille and the rats all swarm out of the old lady's house, I don't blame her from shooting a shotgun at them. Nasty, nasty. I'm glad you got rid of your problems!! Hopefully no more will come back!!!! and this post MADE ME LAUGH!!! 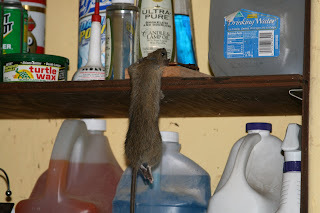 we have a little rodent problem of our own right now...only we are lucky enough to only have the little critters in our garage and not in our home. EWWWW!!! everyday mitch goes out there to check his little traps and sure enough he seems to get atleast one. he thinks we've caught about 8 so far!!! isn't that disgusting?? it just shocked the crap out of me when mitch said he say ONE mouse scurry across our garage floor. i mean where in the heck are they hiding?? our garage is pretty clean, and who'd a thought that we had a whole freakin' family living out there!! and unfortunatley we're still catching them as of today. praying they'll be gone SOON!! Amazing photo! We had mice in the fall and I about died! I was so mad and disgusted at the same time!